Switching from frozen to fresh? Did your supplier send you sugar in a 50 lb bag instead of the usual 25 lb bag? Were you getting Tyson 2116 5oz breast from Agar Food Supply and you switched to Pierce 2341 5oz Breast from Performance Food Group? Or perhaps you are replacing a bottled or canned item with an in house prepared item. Or one of your employees entered an item you already receive but under a different name (herbs, basil exists but they created a new item called basil, fresh). Keep your recipes priced correctly even when using different inventory. Substitutions will ripple through every recipe using the new ingredient and change the item and the price. 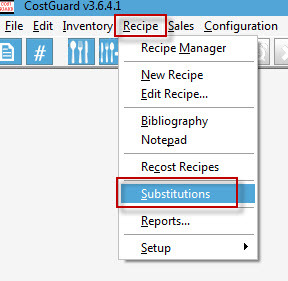 No need to reenter new inventory items for every recipe – CostGuard will make those changes for you automatically.